E.V. 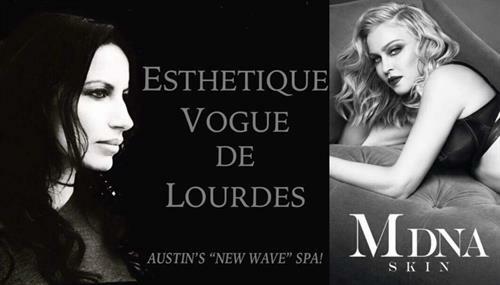 is a high quality skincare Spa in a 80’s New Wave inspired setting and is Austin’s first professional provider of Madonna’s MDNA. Every service is named for thoughtfully chosen song titles and an 80’s soundtrack plays to the taste of each client. The décor is a personal collection of memorabilia with special attention to Madonna ,Simple Minds, Alice Cooper and Dead or Alive. Opening mid October. 1st time visit offers complimentary eyebrow, lip or chin waxing. GIVE GOOD FACE! 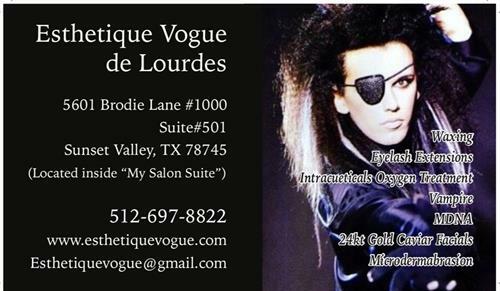 Lourdes Lucas is the founder of Esthetique’ Vogue. Her experiences have led her around the world in the entertainment industry in both creative and administrative roles as a dancer on major tours and as a personal assistant for artists with Live Nation. Artist such as Alice Cooper, Shakira, Kid Rock to name a few.Lourdes was one of th first dancers for “Girlbar LA” in West Hollywood at “The Abbey” which is voted #1 in Gay/Lesbian Entertainment. Lourdes completed the Paul Mitchell Academy for Esthetics program and continued her education at the Central Texas Phlebotomy Institute with certifications in phlebotomy, micro-needling, Skin Pen, Pro Gen PRP, makeup, chemical peels and microdermabrasion. She takes pride in developing skin care treatment plans and customizing home care regimes to help patients achieve their skin care goals. Located in south Austin at Brodie Lane & Mopac shopping center , inside “My Salon Suite” and next door to World Market.